Marvel makes history again with one of the greatest Heroic team ups in the universe. Hulk’s brute strength and Tony Stark’s high-tech intellect come together to create a powerful duo necessary to face off against one of the most dangerous enemies. When “Zzzax,” a seemingly invincible, energy devouring monster threatens to destroy the planet, these two Avengers are mankind’s only hope. Alone, neither can defeat the awesome power of Zzzax. As a team, they just might have a chance – if they can find a way to work together without smashing heads before time runs out! 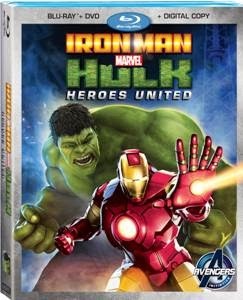 Packed with explosive action, loaded with bonus features and presented in groundbreaking Marvel CG Animation, Iron Man & Hulk: Heroes United is a must-own movie event that will blow you away! We're huge super hero fans in our household, have been for years. There's nothing like watching your little one pretend to be their favorite super hero and watching them come up with an adventure. When I received my copy of Iron Man & Hulk, both my son and daughter were super excited. They've been talking about this movie for a couple of weeks now because they kept seeing commercials. To see two of their favorite heroes together in action made them love these heroes even more. It definitely lived up to what we all expected it to be, amazing. We're always happy watching super hero movies and I love that this was another movie we could watch together as a family. This would be a great add to your kiddos Christmas list, it's a great movie for the entire family and now available for purchase. Disclosure: All opinions are my own. I received Iron Man & Hulk: Heros United at no cost for the purpose of this review. No other compensation was received.